Fashion. There is sort of this caricature of me that I’m not the fashionable person but that Tawn is. Of course, Tawn’s taste is impeccable and his interest in fashion is very high. (See his blog, Bino on Fashion) But that doesn’t mean I’m disinterested in fashion or don’t appreciate it. I just rarely put too much thought into matters of fashion. 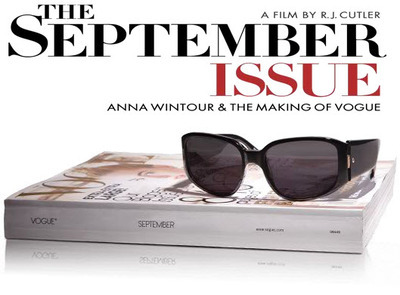 Last week we saw The September Issue, the new documentary by R.J. Cutler that is essentially the story of the person who inspired The Devil Wears Prada. Anna Wintour, the editor-in-chief of Vogue magazine, is the high priestess of fashion, nearly singlehandedly starting trends and choosing what is in and what is out. The real star of the film, though, is Grace Coddington, a former model who is the creative director at Vogue. Somewhat of a yin to Wintour’s yang, Coddington fights to include things she thinks are beautiful and deserving, even going behind Wintour’s back in one sequence to order undone some airbrushing she thinks is unnecessary. Coddington and Wintour both started at Vogue the same day twenty years ago and have this interesting relationship that is both collaborative and antagonistic. Watching this film provided an interesting insight into the world of fashion. It also helped me coalesces some of my feelings about fashion. 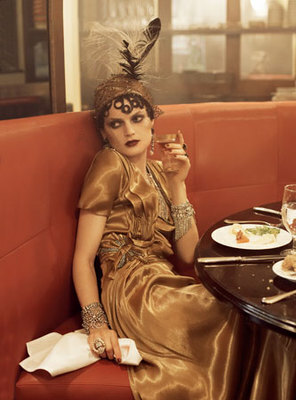 Left, one of the photos from the September 2007 edition of Vogue as part of a shoot that Coddington designed. If I’ve earned a reputation as a fashion phoebe, it is because (aside from my general lack of style in dressing myself) I don’t see a need to know which designer is whom, what the latest style is, and what color will be in next autumn. Who is the designer at the house of Dior? I don’t know. What is the significance of the Channel Chanel 2.55 bag? Couldn’t tell you, although Tawn has tried to educate me in these matters many, many times. But when I watched the film, I enjoyed seeing the display of moving art worn gracefully by the deadly serious (and deadly skinny) young ladies strutting the catwalk. Whatever happened to smiling models? Wouldn’t people prefer to buy fashions that appear on friendly looking ladies? I enjoyed seeing the passion and joy of some of the people involved in the business, especially the care Coddington gives to designing each photo shoot and the passion that young designer Thakoon Panichgul, a Thai-American whom Vogue selected for a young designer award and who is featured in the movie, puts into designing a modern take on the white t-shirt. These people love what they do and are very gifted artists. No, the thing that disinterests me about fashion is best exemplified by one of the various subeditors or whatnot who in the movie is caught on film constantly saying a different thing to each person, complimenting the ideas of whoever is talking and then back-stabbing them when they are out of the room. That reminds me so much of what I found in the movie industry when I lived in LA. Petty, petty, petty rivalries, hangers-on, and people whose interest was not about the art but about their inflated sense of self-importance. There’s a lot of that in many fields, I’m sure. But I think fashion has to take the proverbial cake in terms of people who try and use fashion and style as a way to validate themselves and to elevate themselves over others rather than as a way to truly express themselves as individuals. Chanel 2.55 bag – huh? I had to look it up. Chanel? Dior? Haha~you many find the info handy when shopping with Tawn, in HK perhaps! I do enjoy looking at nice dressed people; admiring their passion and have the ability to know how to look good! One time, a friend said, “it is an LV” and I looked blank! lol, now you know I have a lot to learn in that department. hehe. oh, my my. I just click onto Tawn’s blog site, and he surely knows his fashion and has good taste. very impressive. kudos to Tawn. “inflated sense of self-importance” haha. I am not going to say anything. I’d be in your camp. I don’t have the time nor energy to be on top of the latest fashion trend and such. I just wear what I feel suits me and that’s it. @yang1815 – Or Steve Jobs – black mock turtlenecks all the time. @TheLatinObserver – Amen. @Dezinerdreams – Val’s right; you fall into the “passion and joy” category. Will let you know if it becomes the “inflated sense of self-importance” category. =D @murisopsis – “Put together” only to the extend that I wear roughly complementary colors…@SamsPeeps – It seems I attract a certain readership… =D@stevew918 – And nice looking undressed people, too, right? @CurryPuffy – @ElusiveWords – It was only when I read your comments that I realized I had mis-spelled “Chanel”. D’oh. @christao408 – Exactly! Simplicity hardly ever goes out of style. well, I am with you Chris. But my daughter knows so much, and I have to constantly try hard to not insult her sense of fashion by wearing something that does not match. I am going to check Tawn’s blog now. I personally like it when models don’t smile, and have that fierce brooding look hehe. And I’m all for my 30 dollar jeans and cheap vintage t-shirts. That’s all the fashion I need. I’m kind of with you; I’m just not that into fashion. I really like purses and jewelry but that’s about it. The likeness in The Devil Wears Prada to the documentary is uncanny at times…right?